German official clarifies 'Middle East policy hasn't changed,' after Der Spiegel reports Merkel will end support over frustration with Bibi. A German official on Sunday denied a report in Der Spiegel the day before, according to which Chancellor Angela Merkel may end unconditional support for Israel due to frustration with Prime Minister Binyamin Netanyahu's policies. The German government official told Reuters in response to the report that "the guidelines of German Middle East policy have not changed." 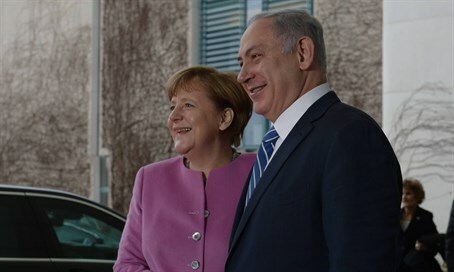 His rejection came shortly after a senior Israeli official likewise denied the report on diplomatic tensions, saying it appeared to be an attempt to attack Merkel for her close ties with Netanyahu by members of the Social Democrats (SDP), a member of Merkel's coalition government. A spokesperson for Merkel declined to comment on the report, and referred to the regular governmental news conference set for Monday. Germany has supported Israel for decades, largely out of an apparent feeling of responsibility for the brutal murder of six million Jews by the genocidal Nazi regime during the Holocaust. However, Der Spiegel quoted Rolf Mutzenich, SDP's deputy floor leader in the Bundestag lower house of parliament, as saying, "the perception has been growing in the German government that Netanyahu is exploiting our friendship." The report also cited German officials saying the country should be more critical of Israel, in a growing hostility over Jewish construction in Judea and Samaria, the Biblical heartland of Israel. "Israel's current policies are not contributing to the country remaining Jewish and democratic," the paper quoted Norbert Roettgen, a member of Merkel's Christian Democratic Union and chair of the Bundestag's Foreign Affairs Committee, as saying. "We must express this concern more clearly to Israel," added Roettgen.